On the night of 9-10 August 1915, the Zeppelin L 10, commanded by Oberleutnant Wenke, was one of five German airships which set out to attack targets in England. The airship crossed the coast at Aldeburgh at about 9.40 p.m. and steered for London on a south-westerly course. After maintaining this course for some time, Wenke changed to a south-easterly course, and shortly after midnight he made his attack in poor visibility on what he thought were the London docks. He was in fact some 30 miles to the east of the capital and his bombs fell, not on London, but on the Isle of Sheppey, at the mouth of the Thames. Of the other four airships taking part in the raid, only one, the L 9 commanded by Kapitanleutnant Loewe, succeeded in reaching the area in which his target lay. HOUSES SET ON FIRE. NO PERSONAL INJURIES. A Zeppelin airship appeared over the East coast early on Friday morning, and dropped bombs on Ipswich, Bury St. Edmunds, Whitton, and Aldeburgh. The only serious damage done by the Zeppelin was in Brookhall-road, where three houses were set on fire and gutted. No personal injuries are reported. At Bury St. Edmunds two shops are on fire, the borough market, and one in St. Andrews-street. Nobody injured. 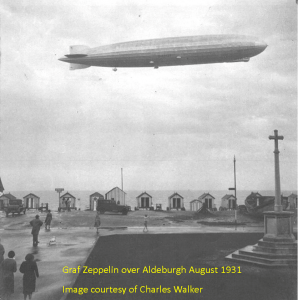 The Zeppelin is also reported to have dropped bombs on Whitton, without doing any damage and to have appeared over Aldeburgh. The latest reports estimate that a dozen bombs were dropped on Bury, and six on Ipswich.